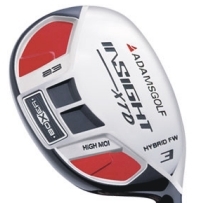 Insight XTD a3 is specifically designed for medium to fast swing speeds. It provides the easy-to-hit performance of a hybrid and greater distance than a traditional fairway wood by combining the best features of Adams' Idea Boxer Hybrids with the best features of their legendary fairway woods. The result is the new Insight XTD a3 Hybrid-Fairway Wood that will kick traditional fairway woods to the curb. Increased ball speed for a hotter, longer ball flight. 11 yards more distance compared to conventional oversized fairway woods. Unique sole shaping and design results in 22% less turf drag that increases versatility and playability off the ground. Increased inertial properties around the hosel achieves 41% more MOI for greater forgiveness.